I’ve stood beside Jean Béliveau, and you know what they say about Jean Béliveau: he would have been governor-general except that he said no when the prime minister asked him, no, thank you, he probably said, if I know Jean Béliveau. I don’t, not really, not so well, we were only together for a minute or two while someone else, your proverbial third party, aimed her Polaroid at us. A Polaroid — that’s how long ago this was. He’d just written his book and I’d gone ahead and read it, two circumstances that eventually joined into one, which was the taking of the picture, which I got to keep. 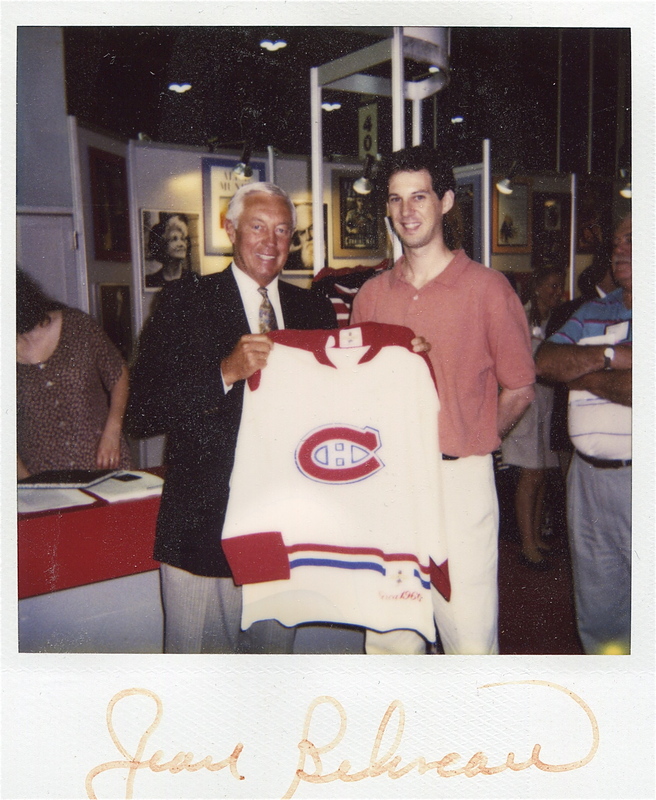 I was taller, but Jean Béliveau had the whiter hair. 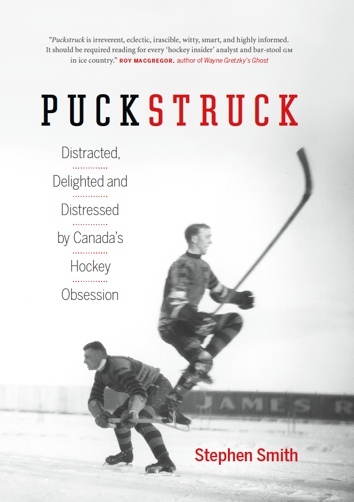 I wore an orange shirt, a summer shirt, while the season of Jean Béliveau’s outfit — his more formally fitted blue blazer, his tie of ascending arrows, his grey flannels — was fall or winter. He had a southern tan. The woman with the Polaroid was the publicist. I’m speaking here, of course, of a marketing opportunity at a trade show for booksellers. Between us, Jean Béliveau and me, we held up a Canadiens jersey, home-white. When he autographed my Polaroid his J and his B came out looking like pretty good sketches of butterflies. I’ve stood next to Ken Dryden, too, another of your Montreal Canadiens Conn Smythe Trophy-winners who’s shorter than me. Although it’s true that when we sat down, Dryden was somehow taller in his chair than I was in mine — roughly the same chairs. This was true the whole time we were seated. He had — what else can I tell you? — the taller torso. Say for a minute — pretend — that the prime minister didn’t take Jean Béliveau’s no. Wouldn’t. Jean Béliveau — imagine the p.m. speaking here — Jean Béliveau, no is the one answer I can’t accept, it’ll have to be yes. I don’t know why the prime minister would be calling him Jean Béliveau and not M. Béliveau, or Jean, but that’s how it is in my head. What can Jean Béliveau do? He shakes the prime minister’s hand. At which point history would be forced to record him — Jean Béliveau — as a man of several vice-regal firsts. First former teammate of grown men nicknamed Gumper, Boom-Boom, Rocket, Pocket, Digging Dicker, and The Roadrunner to take command of the Canadian Armed Forces. First tenant of Rideau Hall to have his accumulated regular-season penalty minutes (1029) printed in 10-point characters on page 862 of Total Hockey: The Official Encyclopedia of the NHL. Though not, I’m afraid, the first g-g to have stood next to me. Because, in truth, I’ve stood next to Her Excellency Jeanne Sauvé also, at Rideau Hall, in a room with two fireplaces. That was no contest, that time, in terms of height — Madame Sauvé found it particularly funny, the degree of my looming advantage. Though she did have the silverer hair. I remember asking, why the two fireplaces? and being told some good reason for it. And later — late — an aide de camp, Captain Levesque, fetched his cavalry sabre to open a bottle of champagne with a swash of blade up its neck. I slept the night, guest of the government, in the Bessborough Room at Rideau Hall, where a Spanish friend of mine broke the TV by switching it on. The Honourable Maurice Sauvé told me about the two fireplaces, I remember now — it was an old Abenaki trick, he said, to keep you warm back and front. The Right Honourable Michaëlle Jean I’ve stood across the room from — by the wild blue ocean in Newfoundland. I wish I’d seen him play. I would have liked to have seen Howie Morenz and Maurice Richard, and Béliveau is right up there with those two, for me. There’s a line of, I think it’s Hugh Hood’s, about him, Béliveau, when he had the puck on his stick: he could navigate his way around the ice like a lunchroom pro carrying his peas on a knife. That I wished I’d seen. I had no idea they called Dickie Moore Digging Dicker. The rest of those nicknames I’ve always known .